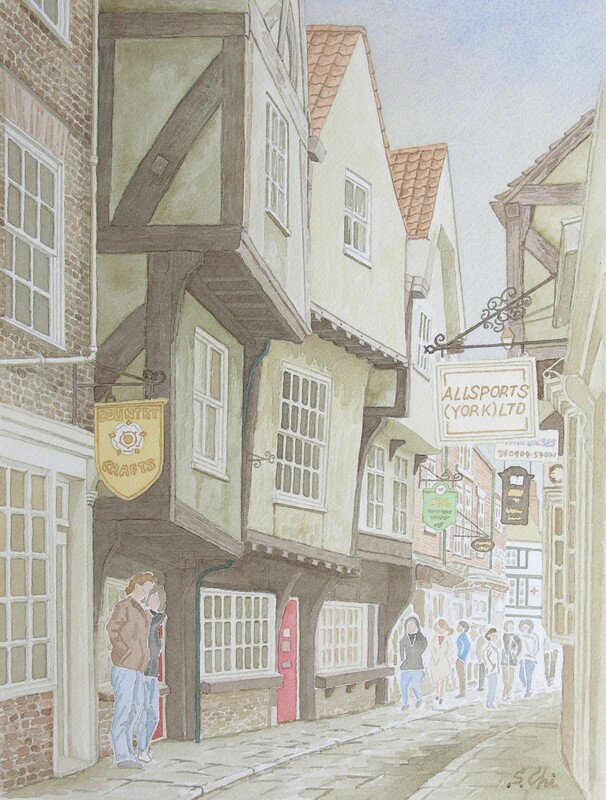 The Shambles, a narrow street symbolising medieval York, is said to be one of the best preserved medieval streets in Europe. It is my favorite street in York. On both sides of this street, timber-framed houses stand overhanging it. As the upper the storeys go, the more they overhang, one could jump from the window of the second floor into the opposite side window across the street, I thought. The name of the street, the Shambles, derives from "shamel", the Angro-Saxons' word meaning a stall to display meat for sale. In the Middle Ages, butcher's shops stood side by side on the both sides of this street. No. 35 is famous Margaret Clitherow's House, now the Shrine of St Margaret Clitherow. Margaret, a young butcher's wife is said to be alleged to have hidden Jesuit priests in her house, whose missionary work was forbidden in those days in England. She was pressed to death on the 17th of March in 1586. To my surprise, it was in 1970, almost 400 years later, when she was cannonized as St Margaret of York. 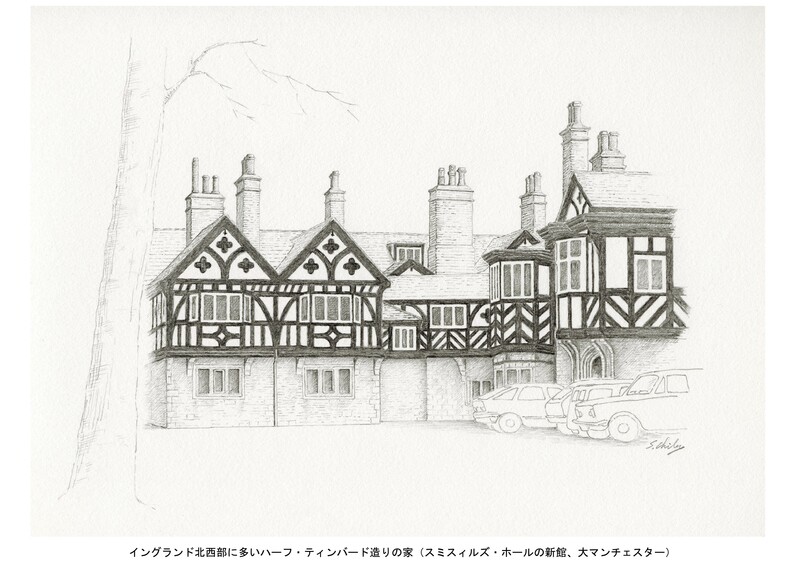 I like timberr-framed houses, because they have similarity to the traditional Japanese houses. Both of them are made with timbers and walls covered with plaster. 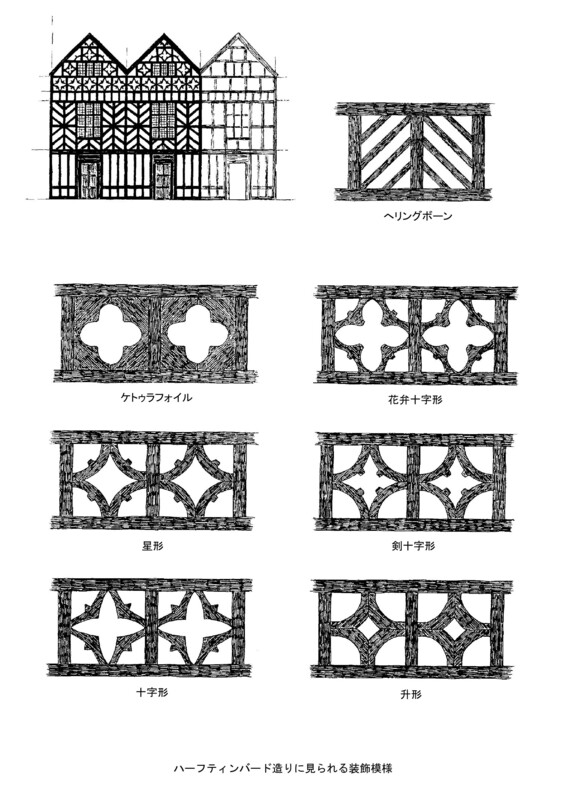 The upper stories of English timber-framed houses overhang to make what are called jetties, but Japanese houses are not jettied to the outside. Some of three-storey timber-framed houses, having big heads, look like as if they were mushrooms. The exposed timbers used for posts, beams and braces become old to be discoloured and the grains of wood are in relief. The surfaces of the walls, which are filled with wattle and daub, then covered over with plaster, are weathered and blurred with rainwater to draw patterns. These timbers and walls look very old, very charming. Furthermore the houses are often distorted and lean somewhat on one side. Those features are also charming. I love them very much. 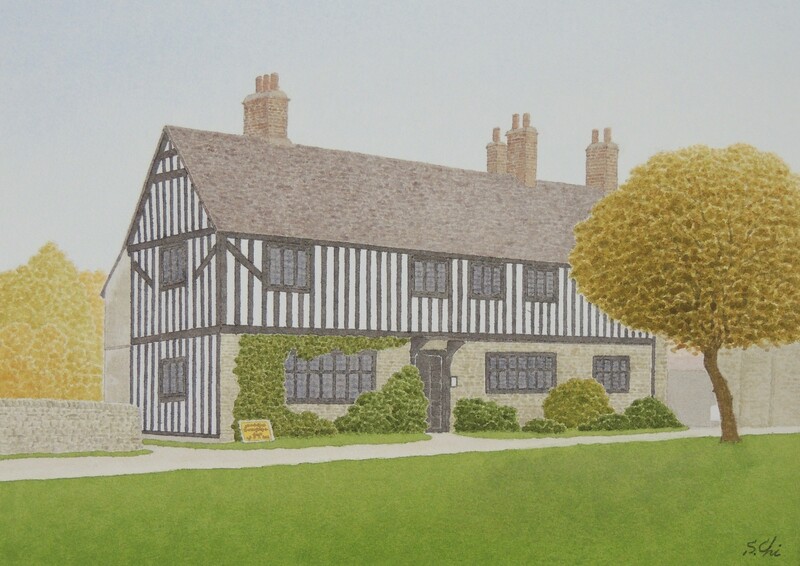 The timber-framed house which has many studs or braces is called half-timbered. In some half-timbered houses, the timbers are painted black and the walls are white. The contrast of black timbers and white walls is vivid and those houses are beautiful. They are often called magpie houses, though some of them, such as Little Morton Hall, Cheshire, are too showy. Frankly speaking, I prefer unpainted houses.